Black Friday has become the regular precursor to Christmas that allows brands to whip shoppers up into a spending frenzy. Whilst some are braving the sales in search of affordable Christmas gifts, many tech-savvy shoppers will opt to browse the bargains from their sofa. According to GlobalData, shoppers are expected to spend £10.1bn in the week of Black Friday – nearly 4% more than last year. However, shopping stampedes are expected to be less likely in 2017, as most activity is expected to be online. With this in mind, many brands are rolling out their online Black Friday promotions in advance. Whether it’s through email, paid search or paid social campaigns, Return takes you through some of the biggest and best Black Friday promotions, and explains what is (and isn’t) effective. 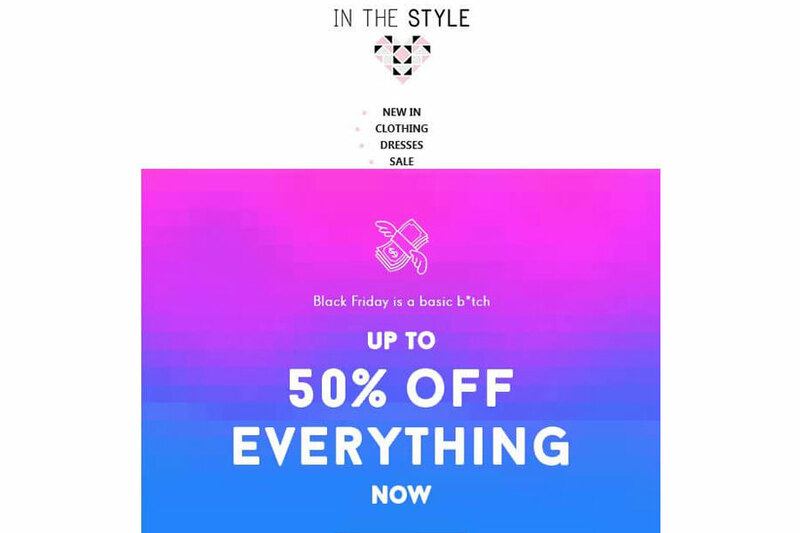 In The Style have reached out to their customer base via email before Black Friday offering another sale – up to 50% off of everything. As 50% is more than many brands offer in their Black Friday sales, this preliminary promotion targeted at Black Friday-ready buyers is a stroke of genius. Buyers don’t know if the Black Friday sale will offer more than 50% off, prompting them to buy now rather than later. The colourful copy is also playful and on-brand – nobody wants to wait for a basic b*tch. 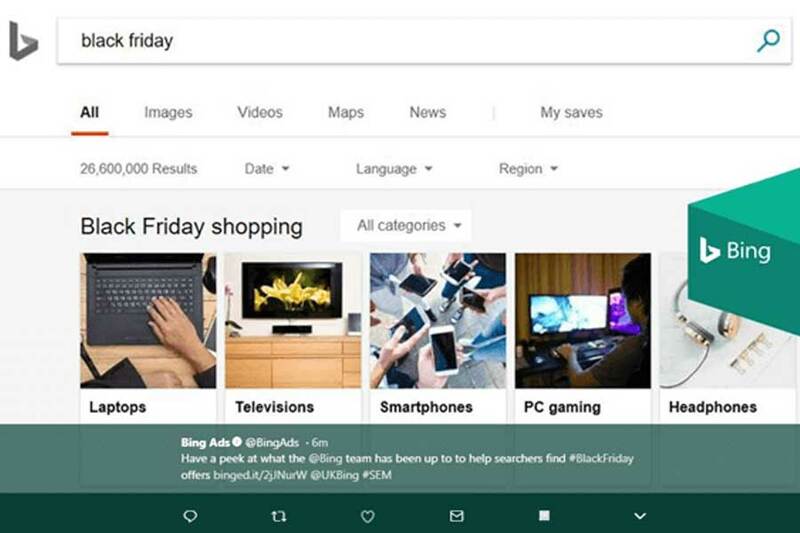 Bing are striving to take the pain out of bargain-hunting by segmenting popular Black Friday deals into simple, clickable categories. This makes Black Friday more accessible, allowing users to access the deals quickly, before they sell out. Not to be outdone, Google have enhanced their mobile shopping experience in time for the Cyber Weekend. 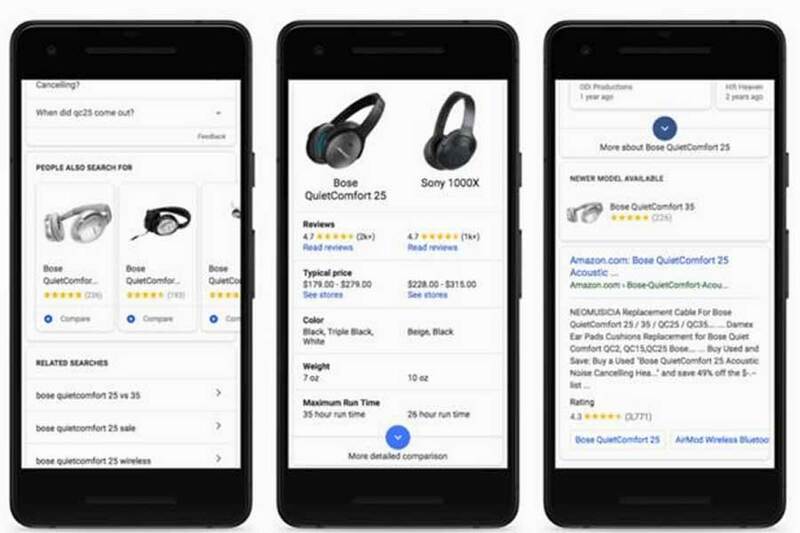 Buying guides and additional product-related information will show up for specific product searches. Other tweaks include the introduction of a “newer model available” tag for gadgets, so shoppers can be sure they’re buying the latest version. 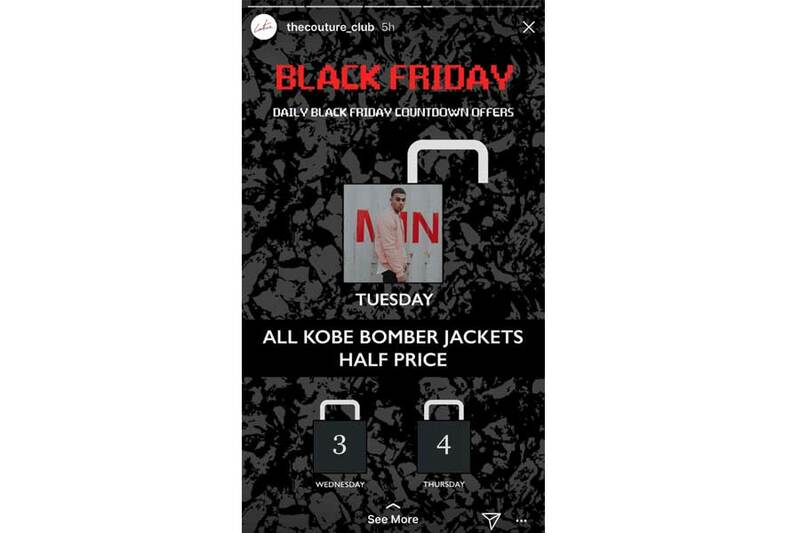 Men’s and women’s outerwear retailer Manière De Voir has built up to Black Friday by running a different promotion every day. 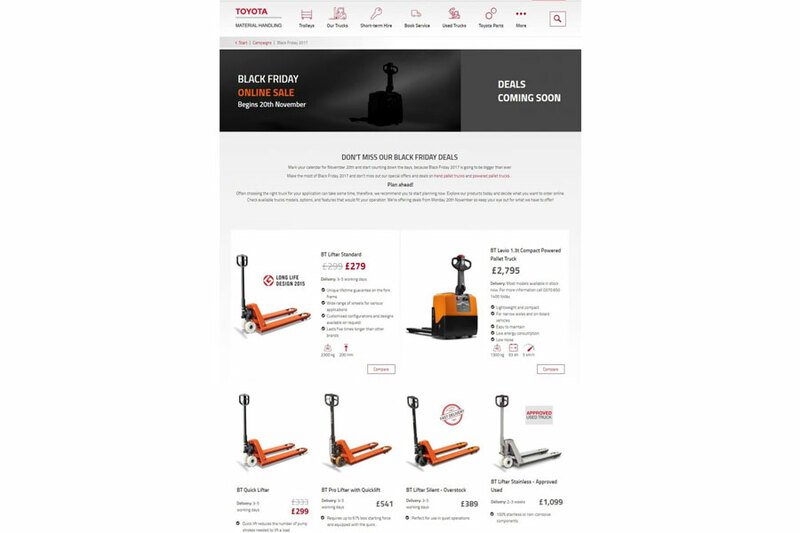 In a bid to acquire long-term customers during what is a traditionally fickle, price-sensitive shopping period, the brand’s homepage features a prominent “Black Friday Loading” box, urging consumers to sign up for Black Friday discounts. The Killing Tree Clothing are offering customers a 15% off pre-Black Friday sale like a lot of other brands – but there’s a catch. The brand have also chosen to include in their email to customers a list of “hot-selling” items that “will sell out a few nights before Black Friday”, and the coupon is only valid for 48 hours. Sneaky, but it works. The Couture Club posted on their Instagram story about their Black Friday countdown offers. 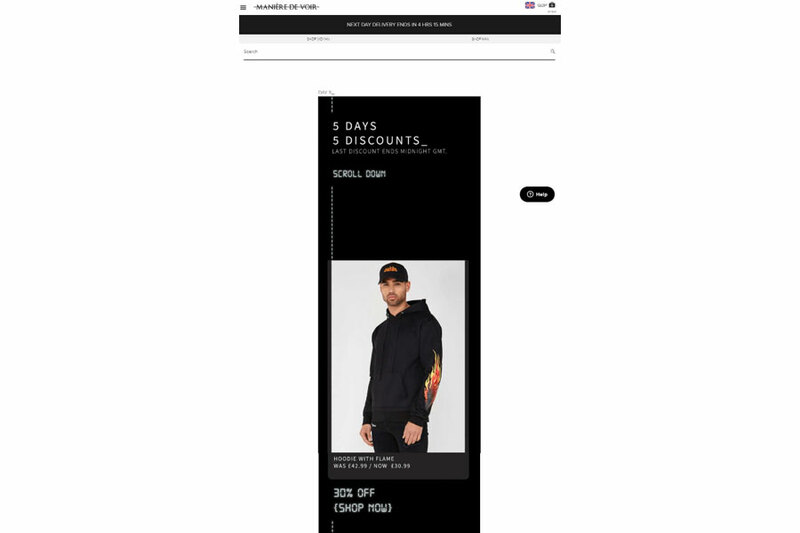 As well as understanding the social media habits of their clientele, The Couture Club have given their Black Friday ad a sort of gaming feel. Each day unlocks a new offer, making it exciting for customers who are paying attention, but also putting a limit on the time they have to buy. We spotted that many companies are encouraging would-be customers to register in order to get early access to a deal. Flying in the face of the $300 Million Button, this boosts sign-ups and opt-ins for CRM purposes – particularly with first-time users. This means that the customer making an account just to access the Black Friday deal will continue to receive emails from the brand after Christmas and into the new year. Black Friday deals aren’t just for consumers. B2B brands, although slower on the uptake, are starting to see the value of riding the sales wave of Black Friday weekend. 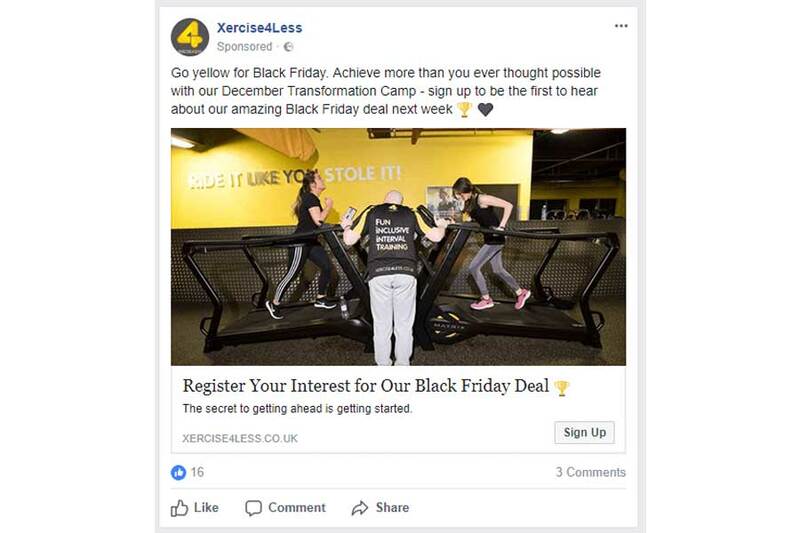 Xercise4Less is another brand urging customers to sign up for an advanced preview of their Black Friday deal. By baiting customers with the temptation of a Black Friday discount via email, the brand gets more opt-ins, which in turn gives them the opportunity to form a strong relationship with their new customers. 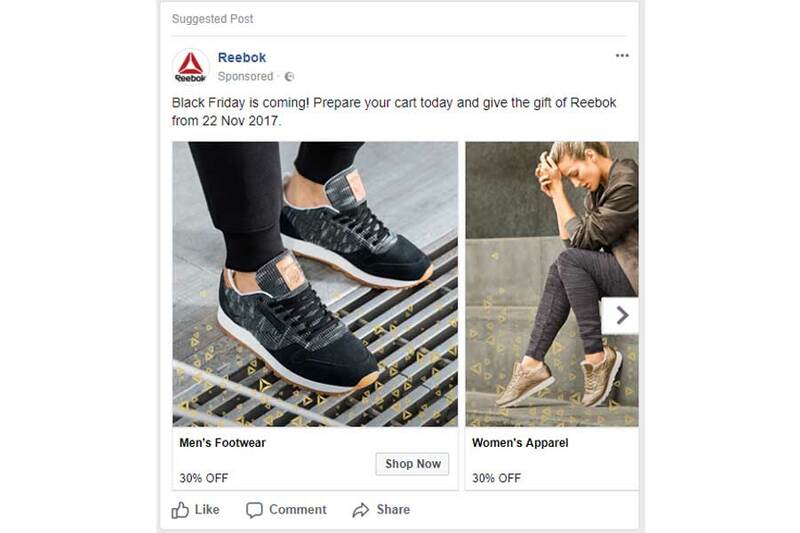 Reebok have opted for a simple Black Friday ad. Their heading doesn’t indicate their discount – it simply urges shoppers to prepare early. It is only when the customer inspects the carousel images that the eye is drawn to a very small “30% off”. Unlike other ads, there are no sign-up / coupon offers – this ad is quite simple and could be optimised much better. 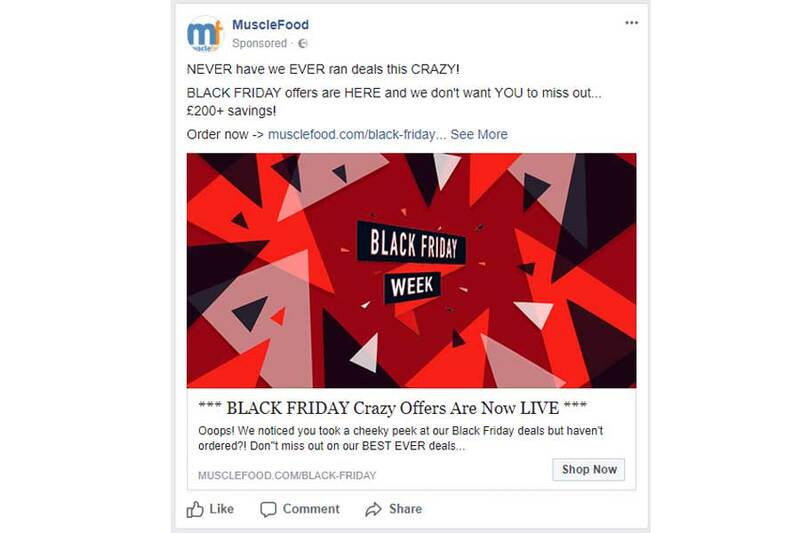 MuscleFood is direct and to the point – it outlines potential savings, links through to their site, and indicates boldly that their Black Friday sales are now live. The scatter-gun approach to capitalisation in the ad copy may be a tad off-putting to some, but there’s no denying that the copy effectively communicates their Black Friday proposition. 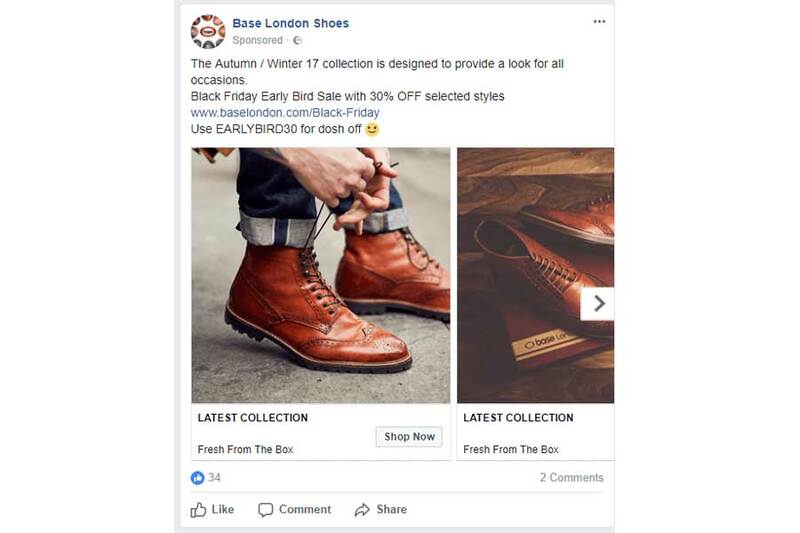 Base London is offering customers targeted via Facebook 30% off selected styles using a coupon code. As with many Black Friday pre-sales, the brand does not indicate how discounted their Black Friday sale will be in order to attract customers to their early offer. Practically speaking, this is a good way to spread sales across the Cyber Week and reduce the strain on your site on Black Friday itself. 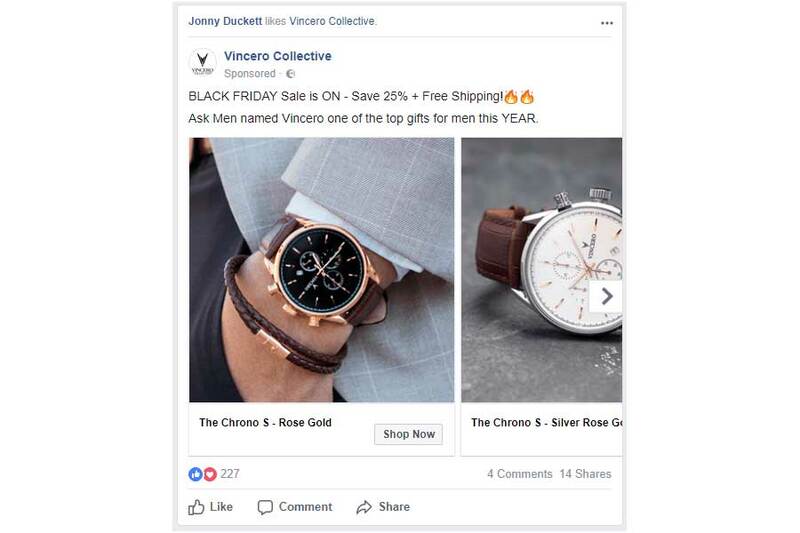 The Vincero Collective is another brand using sponsored ads, offering 25% off and free shipping in their week long Black Friday sale. The free postage is a good gimmick implemented by brands – provided they can spread demand over the week and fulfil the shipping requirements, that is. House of Fraser mention Black Friday FOUR times in their sponsored post (and once in the picture), so they’re really hammering the message home. For their event, House of Fraser are offering 40% off plus free postage on purchases over £50. As well as implementing the free postage ploy to their customers, House of Fraser effectively insure themselves against paying for delivery on purchases that aren’t going to help their profit margins (AKA those under £50). 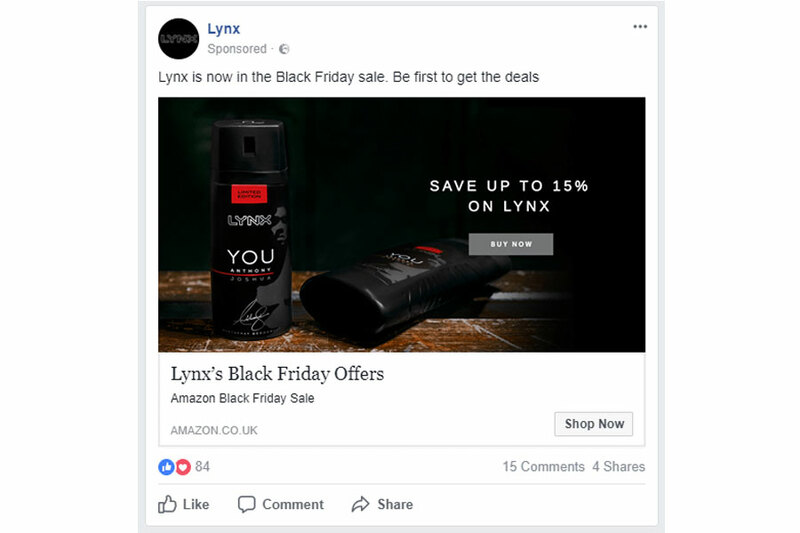 Lynx are using their budget to promote Amazon’s Black Friday sale. This is a good example of collaborations from brands who are trying to push sales via resellers. As Amazon is a Black Friday giant, this collaborative effort is likely to get Lynx a lot more sales without having to worry about fulfilling huge numbers of deliveries itself. ad:tech have come through with a tongue-in-cheek promotion for their next London event, which starts on Wednesday (November 29th). 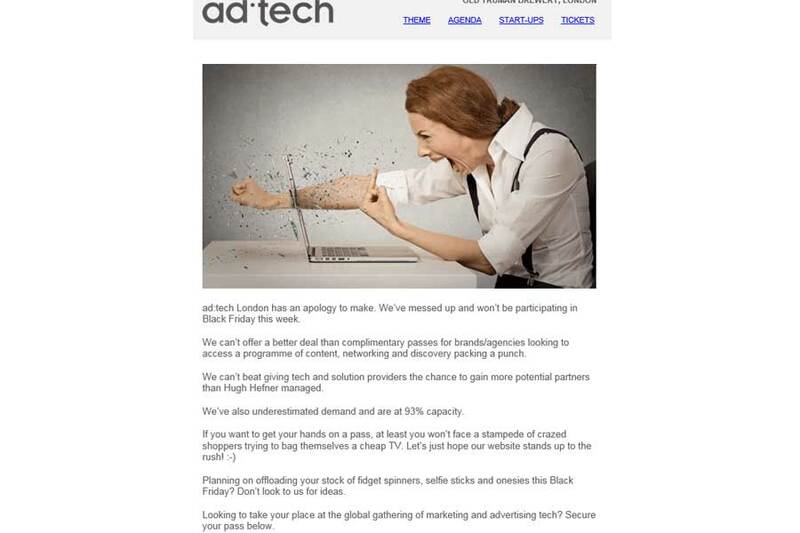 Clearly aimed at those sick of receiving emails about special deals and promotions, this approach delivers all the information potential attendees need to know, while also raising a middle finger to the whole concept of Black Friday. Did you find the build-up to Black Friday smooth sailing or choppy seas and endless thunderstorms? Can’t wait to do it all again, or dreading your next big sale? If you’ve spent the last week tearing your hair out, biting your nails and screaming at your colleagues, relax! 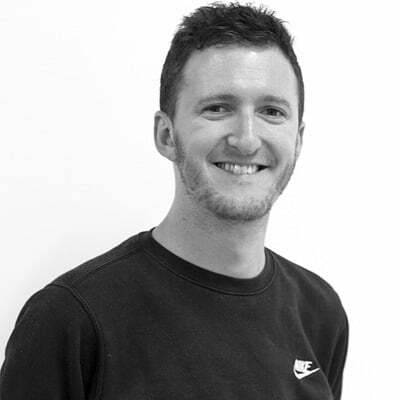 Get in touch today and find out what we can do to help out with your paid search and social campaigns.